Cheryl Van Ornam is the Traditional Music Director at Redeemer Lutheran Church in Richmond, Virginia, where she directs choral, handbell and brass ensembles. She is also the organist at First Church of Christ Scientist in Richmond. She has an active piano studio and is a staff accompanist in the Virginia Commonwealth University Department of Music. She holds the Master of Music in Organ Performance and Church Music from Northwestern University. She has been an active participant in the McGill Summer Organ Academy (Montreal, Canada); International Haarlem Summer Organ Academy (Haarlem, The Netherlands); and Smarano Organ Academy (Smarano, Italy). Her teachers include Maggie Kemper, Doug Cleveland, David Craighead, and James David Christie. She has served as the accompanist for the California Boys’ Choir, the Chicago Archdiocesan Boychoir “Cantores minores”, and the Nairobi Music Society in Nairobi, Kenya. She is also active as an accompanist for choral ensembles in the Richmond area, performing large choral works as the organ accompanist. Concert (recital) venues include the Cathedral of Our Lady of the Angels (Los Angeles), Bruton Parish Church (Colonial Williamsburg), King’s Chapel and Harvard University (Boston). 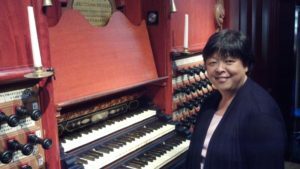 She has been active with the American Guild of Organists in Chicago and Boston and is the Dean of the Richmond, Virginia Chapter. She and her husband have two married children.